According to the findings of an investigation by researchers at the University of Illinois at Chicago, regular consumption of black raspberries may help prevent colorectal cancer. The study, which was featured in the journal Cancer Prevention Research, tested the effectiveness of supplementing the diets of cancer and colitis prone lab mice with freeze-dried black-raspberry powder. The two types of mice, technically referred to as strains Apc1638 and Muc2, are engineered to lack specific genes which significantly reduce their chances of developing either colorectal cancer or ulcerative colitis, respectively. 60% fewer tumors in black raspberry group! The mice were randomly assigned to one of two groups, both of which were fed a high-fat, vitamin deficient Western-style diet. Members of the experimental group were also fed dried black-raspberry powder in large quantities equal to about ten percent of their total base diet. No additional changes were made to the diets of the control group mice. After 12 weeks, the number of tumors noted in cancer-prone members of the experimental black raspberry group was about 60% lower than statistical average. Similarly, a 50% reduction in instances of tumor formation were noted in colitis-prone Muc2 members of the experimental group. Researchers behind the study attribute the reduction of tumors in the Muc2 mice to a reduction in chronic intestinal inflammation, an effect of colitis which is known to contribute to the development of colon cancer. 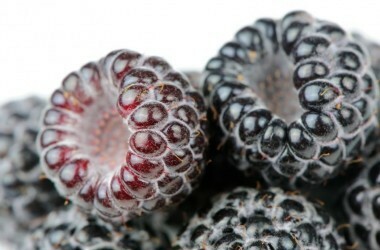 How do black raspberries prevent cancer? This latest study builds off previous research that has found raspberries, black raspberries and blueberries all contain varying degrees of specialized antioxidants that are believed to have not only cancer-fighting qualities, but also strong anti-inflammatory and anti-neurodegenerative characteristics. In fact, the researchers behind this most recent study suspect that the black raspberry’s ability to fight inflammation throughout the body may be the source of its ability to fight cancer (and potentially certain neurodegenerative conditions as well). Ongoing inflammation causes a great deal of stress on the body. In the case of colitis, this prolonged irritation can permanently damage sensitive digestive tissue, causing them to mutate and become cancerous. Dr. Wancai Yang, the study’s senior author, hopes that these preliminary findings will enable his team to gather the additional funding they to begin testing the effects of black raspberry in humans. Beyond its potential application as a cancer-preventative, Dr. Yang suspects the compounds in the berry may also help combat other serious health conditions such as heart disease and certain forms of mental degeneration in the elderly. I know black raspberries have a higher orac score than blackberries (19000 vs 6000), but any big nutritional differences? They’re also delicious… just sayin’. What on earth are black raspberries? Do you mean….blackberries?